The full trailer for the star-studded movie "24/7 In Love" has been released on Saturday. The romance anthology follows the story of Jane (Kathryn Bernardo) who is an avid fan of singer Billy Fernandez (Daniel Padilla). In order to win tickets to Fernadez' concert, Jane joined a video contest which asked her to answer the question: "What will people do before the world ends?" In her quest to find the answers, she met different people who will tell her how powerful true love can be. Among them were Virgie, a 40-year-old virgin who will meet callboy Charles (Sam Milby); the hopeless romantic secretary Barbara (Maja Salvador) helping her boss Ken (Diether Ocampo) with personal issues; Verna (Angelica Panganiban) who went to vacation in Vietnam and will meet waiter Elvis (John Lloyd Cruz); Belle (Bea Alonzo) who is in love with gay best friend Butch (Zanjoe Marudo); a 35 year old mentally challenged Mike (Piolo Pascual) with his two child friend (Zaijan Jaranilla & Xyriel Manabat); and an active account executive Patty (Kim Chui) who wanted to get Alvin (Gerald Anderson) as a model for their company. 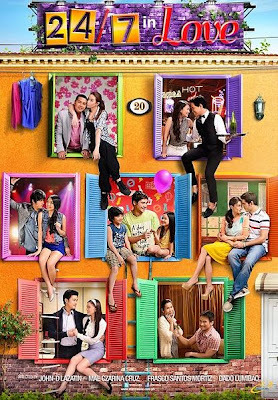 Directed by John D. Lazatin, Mae Czarina Cruz, Frasco Santos Mortiz and Dado Lumibao, "24/7 In Love" will be released on November 21, 2012. 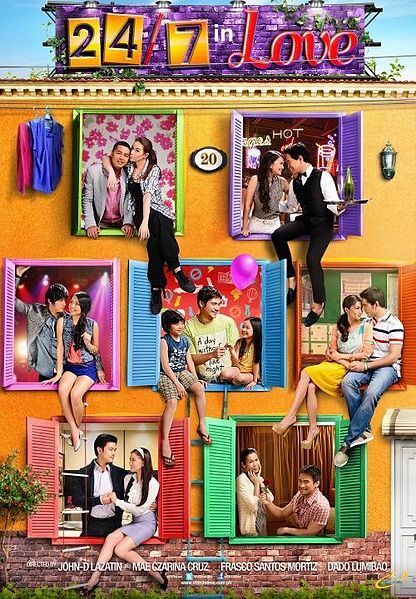 The film is a 20th anniversary offering of Star Cinema.